Managers and consultants consistently note that much of what has been planned is not implemented and that on the other hand other things that were not planned successfully emerge. The driving forces for innovation are for the main part hidden in the tacit knowledge of organizations. This is where Management Constellations come into place. They permit to gather information that is otherwise not immediately accessible. When it comes to making critical decisions there is hardly any tool that is so quick and accurate in pointing to the relevant factors. 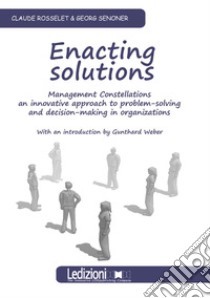 Furthermore various alternative actions can be simulated to evaluate the potential effects.This book is aimed at managers and consultants, who want to break new ground in developing the potential of their organization. In the first part the authors present the theoretical background of the methodology. Part two is meant as a field book for the practitioner who wants to integrate the method into his work as consultant or manager.